Tonight, we invited a pirate, the Easter Bunny (aka Harvey Winkleblatt) and a reincarnated horse into our dining room. And what fun we had! 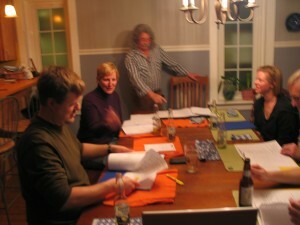 It was the first read-through of the script currently known as Captain of the Chocolate Cake and Other Adventures. 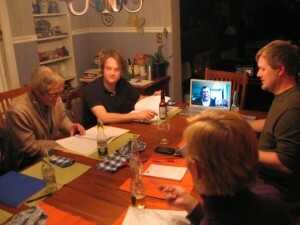 A cast of friends came over for food and drink and in return offered their support, voices and critiques. Around the table were Bruce Cromer, our favorite actor for roles both scary and heartbreaking; Chris Shea, mastermind behind the summer’s best non-theatre fare, Free Shakespeare! ; Malkum Gibson, harp-playing pirate extraordinaire; Beth Wright, world’s best storyteller; Katrina Kittle, world’s busiest writer; Kevin Anderson, namer of Proposal Cake; and friends Marci and Michelle, there to eat good food and be entertained. Dennis Dugan, lighting designer who makes all of us look so good, joined us from the Cleveland area by iChat. We started at Page 1 and read straight through (with a few pauses for raucous laughter, a very good sign). The reading took 50 minutes, our current target length for the finished piece, which we also took as a good sign. Kevin made a fantastic caffeinated Easter Bunny, Bruce a frightening Doubt, a Malkum a jaunty Pirate with a faint Scottish accent. It all sounded very good to our ears. And then we have songs and dances to add. This performance is going to include it all. Now we just have to figure out which storytelling has to be done in these other artforms. All-in-all, it was a great evening. Thanks to everyone who joined us. We look forward to gathering all their feedback and moving on to the next phase of this exciting project. This entry was posted in Uncategorized by puddingstone. Bookmark the permalink.